Insulin is prescribed to people with type 1 diabetes. This is because type 1 diabetes destroys beta cells in the pancreas, meaning that the body can no longer produce insulin. People with type 2 diabetes make insulin, but their bodies don’t respond well to it. Some people with type 2 diabetes may take pills or insulin shots to help their bodies use glucose for energy. This section covers everything to do with insulin - insulin types, prescription, delivery, side effects, insulin pumps, over-dosage, lancets and more. A step by step video guide on injecting insulin. What to do if you forget to inject your insulin. Read reviews to the UK's leading insulin pens. How to get an insulin pump and pump reviews. When was insulin first discovered? It wasn't until 1921 that insulin was physically extracted. This was done by a team from the University of Toronto which included Frederick Banting and J Macleod, who were given the Nobel Prize in Physiology or Medicine in 1923. Learn about basal/bolus and other therapies. See insulin peaks, actions and how long it lasts. How many types of insulin are there? There are 4 types of insulin, based on how soon the insulin starts working (onset), when it works the hardest (peak time) and how long it lasts in your body (duration). However, each person responds to insulin in his or her own way. Rapid-acting insulin (Lispro) reaches the blood within 15 minutes after injection. It peaks 30 to 90 minutes later and may last as long as 5 hours. Short-acting (regular) insulin usually reaches the blood within 30 minutes after injection. It peaks 2 to 4 hours later and stays in the blood for about 4 to 8 hours. Intermediate acting (NPH and lente) insulins reach the blood 2 to 6 hours after injection. They peak 4 to 14 hours later and stay in the blood for about 14 to 20 hours. Long acting (ultralente) insulin takes 6 to 14 hours to start working. It has no peak or a very small peak 10 to 16 hours after injection. It stays in the blood between 20 and 24 hours. Some insulins come mixed together. For example, you can buy regular and NPH insulins already mixed in one bottle. They make it easier to inject two kinds of insulin at the same time. However, you can’t adjust the amount of one insulin without also changing how much you get of the other insulin. Another role of insulin is that when the body does not need energy, it helps the body to store fat. The NHS notes that in type 1 diabetes, the body’s immune system kills off its own insulin producing cells. This means that people with type 1 diabetes can’t produce enough insulin to control their blood sugar levels. As a result, people with type 1 will need to take insulin injections each day -sometimes up to several times a day. According to The US National Institutes of Health, in type 2 diabetes the body struggles to respond to insulin –this is called insulin resistance. It’s almost as if there’s a bad network affecting communication in the body. As a result the body produces more insulin than normal to try to deal with rises in blood sugar. If type 2 diabetes advances, patients may find they need to inject themselves with insulin to keep their blood sugar levels within healthy levels. Injecting insulin is a bit of a pain at first but patients on the diabetes forum report that it usually gets a lot easier over time. Some people with insulin get so used to injecting that it can sometimes be possible to forget whether they injected 5 minutes ago. Insulin helps us to lower our blood sugar and helps our cells to take in energy. But what if we inject too much insulin? The University of Birmingham’s Medical School states that if we inject too much, the insulin will remove too much glucose from our blood and our blood sugar levels will become too low. It’s important therefore that we take enough insulin to stop us having high blood sugar but not so much that we go too low. Your health team should provide you with plenty of help in striking the right balance with your insulin. Download a FREE insulin duration chart for your phone, desktop or as a printout. Insulins come dissolved in liquids at different strengths. Most people use U-100 insulin. This means it has 100 units of insulin per milliliter (ml) of fluid. Be sure that the syringe you use matches the insulin strength. U-100 insulin needs a U-100 syringe. In Europe and Latin America, U-40 insulin is also used. If you’re outside the United States, be certain to match your insulin strength with the correct size syringe. Using cold insulin can make your shot more painful. You can warm an insulin bottle by gently rolling it between your hands before you fill your syringe. If you buy more than one bottle of insulin at a time, store the extra bottles in the refrigerator until you start to use them. Never store insulin at very cold or very hot temperatures as extreme temperatures destroy insulin. Do not put your insulin in the freezer or in direct sunlight. Insulin may lose some potency if the bottle has been opened for more than 30 days. Look at the bottle closely to make sure the insulin looks 'normal'. For example, if you use regular insulin, it should be perfectly clear - no floating pieces or color. All insulins have added ingredients to keep them fresh and help them work better. 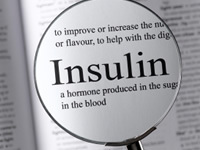 Intermediate- and long-acting insulins also have ingredients to make them act longer. Today’s insulins are very pure. Allergic reactions are rare.